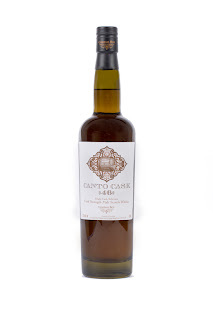 This is part of the Cantos Cask range from Compass Box Whisky Company. These are 16 single cask, cask strength whiskies that are, in effect, variations on a theme, or as John Glaser writes, "a canto within a poem." Using the same malt whiskies (Clynelish, Teaninich, and Dailuaine) Glaser has created 16 unique malt whiskies for different corners of the world. Each bottling has been selected by local importers and have exclusive availability within those markets (thus qualifying for my internationally-themed weeks here on the Malt Mission). This one was chosen by Park Avenue Liquor and is only available in the USA. Pound uses many different 'tools' available to the poet to construct his epic: different languages, verse forms, musical and ideogram notations, etc. Without getting too ostentatious, but feeling the need to make some connection here, John Glaser has similarly used different tools of whisky-making available to him, creating new forms. For the canto range each cask held the same malt whisky, but for the last 18 months the whiskies were aged in a range of different new oaks, both French and American, toasted to variable levels. For Canto 46, the oak is French and toasted to the level '7' (the range within the Canto series is from 4-9). Enough. Let's get to the whisky and celebrate a product of Glaser's unrusted (and well-priced) craftsmanship. All Compass Box whiskies had on the mission can be viewed HERE. Dessert at a candlelit dinner. Soft smoky atmosphere with vanilla, and Honey Nut Cheerios. Firm, hard, strong oak presence in a whisky that, in spite of the abv%, allows deep, prickle-free nosing. The inside of a Mars bar, dish-drying towel moisture and scents(sense?) of cleanliness. Lots of oak influence and a touch of cantaloupe (hehe, CANTOloupe... sorry), the seedy bit. Big bourbony opening with the gorgeous Clynelish shining through, becoming toasty, smoky, and caramelised. Apples and honey, apples with bitter skin, or grapeskin... late flavours of licorice root and honey-sweetened fennel tea. Tingling. Oaky.